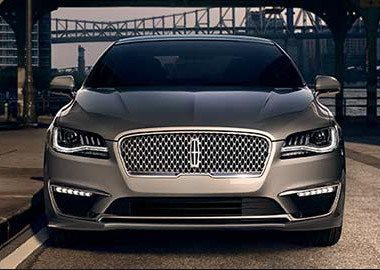 The Lincoln Motor Company has gone to extraordinary lengths to give the exterior of the 2017 MKZ an exceptional level of grace and elegance. An equal amount of effort has been applied to develop and harness the capabilities of an available 3.0L twin turbocharged V6 engine. This engine, delivers 400 horsepower and 400 lb.-ft of torque, making the 2017 Lincoln MKZ one of the most powerful and compelling Lincoln vehicles to ever take to the road. The 2017 Lincoln MKZ is a true driver’s car. To make the driving experience even more distinctive, the available Driver’s Package combines Dynamic Torque Vectoring, a sport-tuned suspension and revised continuously controlled damping. A unique grille, 19-inch wheels and painted brake calipers round out the exterior appearance. Inside, an Ebony interior with Touring White accents and multicontour seats make for an interior experience that is unique to the Driver’s Package. Design that allows for more freedom when it comes to the way we drive. The push-button shifter in the Lincoln MKZ places transmission controls on the center console. These repositioned controls present a fluid and seamless interior design. The MKZ offers an adaptive suspension powered by continuously controlled damping (CCD) that measures suspension, body movement, steering and braking. Within milliseconds the system adjusts suspension damping to help keep your vehicle smoothly on track. In addition, you can manually select from Comfort, Normal and Sport suspension driving modes. The Lincoln MKZ features a number of new and available wheel options. 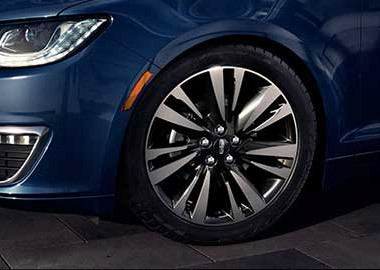 18-inch premium painted machined aluminum wheels with painted pockets come standard on MKZ Premiere and Select models. 19-inch polished machined-aluminum wheels are standard on the Reserve model. 19-inch polished machined-aluminum with painted pockets, seen above, are optional on both Select and Reserve models. 19-inch fully polished 10-spoke cyclonic aluminum wheels are available with the Driver’s package. Whether it’s heading to work, out to play or to visit with friends and family there are many reasons to go for a drive. From a cool blue to an energizing amber, the Lincoln MKZ offers seven color schemes to compliment your driving experience wherever you may be headed. A Wollsdorf-leather-wrapped steering wheel and airbag cover, sculpted pillar and door-trim work, optimized speaker placement and high-end interior surface materials combine to create a visually stunning cabin. Enhanced active park assist helps make getting in or out of tight parking spaces easier than ever. Ultrasonic sensors can locate an available spot and the vehicle steers itself into place. Reverse perpendicular parking guides the vehicle into perpendicular spots, while park out assist aids in getting out of tight parallel parking spots. Meanwhile, you control the shifter buttons, brake and accelerator for a less stressful way to park.